Please be aware that purchase of gift shop items are dependent on availability & inventory. Some orders may take longer to process than others if inventory is low. Shipping & tax is not included in below pricing. This will be added at check out along with any taxes. Keep your eye on the road and hands on the wheel while your car smells fresh. Everyone will want to hop in for a ride when your car is smelling great and looking even better because of your animal themed air freshener. Be everyone’s new best friend at the park or at the party with your hilarious keychain bottle opener. We’ve all been in the situation where someone needs a bottle opener and now you can be that person! Size: Approximately 4 x 1.75"
These Cuddlekins want to go home with you and cuddle! And each time you do, you'll remember the awesome time you had visiting North Georgia Zoo. * Limited Supply-Please call before purchasing to ensure we have what your wanting. These Mini Cuddlekins are even more cuddleable due to their smaller size. * Limited Supply-Please call before purchasing to ensure we have what your wanting. Thirsty? Of course you are, it's hot outside! 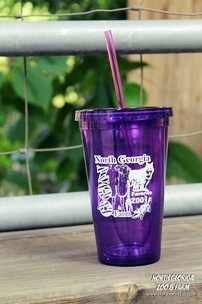 Get yourself a nice cold drink and drink it in style in the North Georgia Zoo Tumbler. Our magnets are 2 x 3 inches in size. They feature some of the animals that call the zoo home. You may even get to see or meet these specific animals when you visit. Featured animals include: wolves, otters, monkeys, kangaroos, wildcats and more. Here at North GA zoo & Farm our mission is to Care, Connect and Conserve! Support our cause with one of these 3x3 Magnets or a Magnet Clip. Please be aware the wood look magnets are made to look like wood but are not actually wooden. Celebrate the good times while remembering the fun you had at the North Georgia Zoo with these shot glasses! Choose between the fun colored bottom glasses or the ice crackle glasses. Chip clip set will come in handy to close snack bags and keep your goodie s fresh for longer. Keep yourself from eating the whole packet or throwing out stale chips with this collection of fun chip clips that seal in tasty goodness for days. 4 clips in 1 set, made with white washed wood. To all the Scouts out there, show your love of North Georgia Zoo with our official North Georgia Zoo & Wildlife Wonders Patch! Bumper sticker pics currently being updated. Sorry for the inconvenience. Need a little pick me up? How about some coffee? Or better yet, how about some coffee in a super cute animal mug?